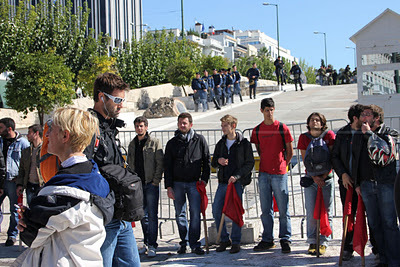 Athens: KNE (youths Communist Party of Greece) and Stalinists of PAME formed a line/chain in front of the police iron walls and squads; outside the parliament; blocking the way to protesters; even asking for journalistic identities to let someone pass through them. Nevertheless, people keep gathering and they seem to be quite determined to stay in the streets, at least till MPs take their vote. as KKE and PAME kept the line of the human-chains, protesters tried to reach the Parliament; KKE and PAME wearing helmets and holding stingers and stakes brutally attacked the protesters who responded immediately with stones, bottles and cocktails; vague endured clashes took place among hundreds of protesters along with the anarchists block and KKE/PAME militants who clearly were there instead of police forces; (scenes that remind us what happened in 17/11/98); as a result the square has been emptied and taken by the police; KKE/PAME give in protesters to cops, as outcome of their perfect collaboration; lots of injured people were hospitalised, one seriously; scattered clashes continued in the streets around the square, while the MPs were voting inside the Parliament; however, protesters willing to reoccupy the square outside the Parliament but riot police/KKE/PAME forces were blocking the way; yet the square was reoccupied by Stalinists of PAME as the police pulled back; eventually the square was full again with PAME on the upper side wishlist on the lower there are the rest of demonstrators as unions, ultra-left and anti-authoritarians; the two parts are separated by riot police that occasionally throw tear gases to the protesters; while KKE/PAME pulled off the upper side of the square, on the lower side there was an extensive use of tear gases; once again as result cops have taken over the guarding of the Parliament as MPs’ were voting for the new finance multi-bill that will be announced later; yet people gathered on the upper part while on the lower scattered continuing clashes were taking place between protesters and police that was blocking the rest of people trying to get on the upper side. Thessaloniki: the demo reached the former ministry but once again Stalinists of PAME have blocked the way forming chains with their bodies; letting no one to pass. Ioannina: more than 3.000 people participated in the demo; about 600 from ESE (Steering Liberterian Union) and Occupations’ Coordinative; some reported that KNE (youths Communist Party of Greece) and Stalinists of PAME have attacked the protesters and blocked their way; but despite their efforts, people understood what was their goal and what really represented. Iraklio, Creta: an action/blockage of a local fast-food branch took place; people refused to leave after police had arrived. Mutilini/Lesvos island: the rally calling for the second day strike completed with success; approximately 400 people attended. Kefalonia island: today is the celebration day of a local saint of the island; therefore a small gathering took place outside the Labour Centre where text was distributed. 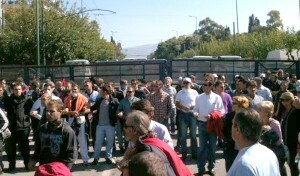 Kozani: many people gathered in the central square and a text was distributed by comrades. Rethumno, Creta: while the demo was occurring; members of KKE (Communist Party of Greece) started to read via the loudspeakers texts against anyone who does not belong to their Party. Patra: This morning about 50 comrades looted large quantities of food from large supermarkets; then they gave it away to the public markets, few meters away, along with dozens of handouts and leaflets; a demo followed in which Popular Assemblies, unions, ultra-left, students and anarchists participated; despite the attacks to banks and cameras, the cops did not react but followed closely approaching the demo from three different sides; following the assembly at the Labour Centre, there is a call on another demo from leftish groups and associations. Volos: after today’s demo, interventions in three supermarkets took place, looting and then distributing the goods to people. Lamia: the number of people exceeded 40; beyond all our expectations; many slogans and great vibe; flyers thrown in all main streets of the city also paint thrown in bank buildings and few slogans were written. Larissa: today’s demo had nothing to do with the one of yesterday; about 100 people all together, indignados, anarchists, anti-authoritarians and autonomous; during the rally cops and undercovers followed really closely being very provocative; as a result people couldn’t to a lot under this terror regime, but constantly insulted them. Xanthi: today’s demo was even higher than expected; over 1.000 people in the streets. Kavala: two blocks demonstrated today; one really powerful of anarchists, anti-authoritarians and ADP around 80-90 people and the one of SYRIZA and indignados around 150 people. This entry was posted in black blogger_K, Greece and tagged 19 20 Οκτωβρη, 48h Sciopero Generale, 48ωρη Γενικη Απεργια, General Strike, Grève générale, Greece, ΚΝΑΤ ΜΑΤ ΚΚΕ ΠΑΜΕ, updates. Bookmark the permalink.